Is your business looking for an attractive marketing display that can be placed exactly when and where it is needed most? Our selection of portable digital signage promotes your brand with video, audio, custom graphics, and images all from a lightweight fixture placed wherever customers will seeThese freestanding electronic sign stands have compact designs that present quality marketing material in retail stores, shopping centers, conventions, and transportation terminals. Our small-frame portable digital signage options feature plug-n-play capabilities via USB upload. This makes it easy to design and present fresh content whenever needed. Video advertising is a key facet of any marketing plan because it grabs customer attention and can be tailored to any brand’s message. 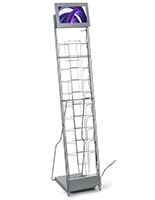 Shop our selection of portable digital signage floor stands for eye-catching electronic displays. What types of commercial advertising screens do we offer? 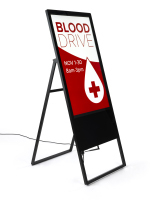 Our floor standing portable digital signage stands feature a simple minimalist design and a 21.5” LED screen with a metal or acrylic support. Flat screens can tilt, rotate, or even change viewing angles to adapt to each customer's preference. Update content via USB or SD card through an integrated media player. 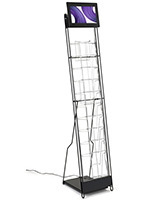 Use these electronic floor stands to display menus, product catalogs, maps, and directional information. 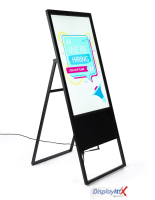 A-frame digital signage kiosks feature a folding design for easy transportation and a large advertising screen. Each electronic sandwich sign conveniently folds up for space-saving storage and agile presentation. These 32” and 43” portrait flat screens feature full 1080p resolution for stunning high-quality graphic displays. Each digital signage fixture is Android OS enabled and comes with WiFi connectivity, making managing content a breeze! Supplement literature racks with signage, offering customers take-away information to review. Each fixture has a 10” screen and 10 wire pockets for dispensing 8.5” x 11” magazines. These catalog holders feature a flatscreen with locking brackets and include a mini HDMI port for external media players. 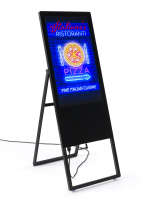 These electronic signage marketing kiosks are an excellent way to reach and engage with new customers and guests. Retail locations use these fixtures to showcase full product catalogs, promotional messaging, and information on limited-time sales. Other industries such as museums, parks, and aquariums use electronic signs to display maps, directories, and exhibit information. 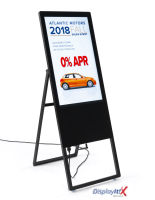 For engaging marketing displays, browse our line of commercial touchscreen stands to give customers an interactive way to view your products and services. These modern sign solutions use the familiar Android operating system, giving both customers a user-friendly experience similar to existing smartphones. Choose an electronic information kiosk to keep customers informed and engaged with your business!